(2 Customer Reviews) | Write Review 6 issues per year The international magazine For radio controlled Jet models coming with all respectable information about Jets, turbines, technique, events and accessories. 66 full colored pages with all information a model-jet pilot needs to know. You'll receive 6 issues during a 1 year Jetpower magazine subscription. Awesome content, lots of info and pics. 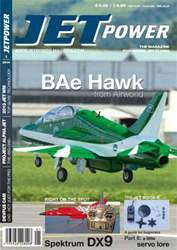 You'll receive 6 issues during a 1 year Jetpower magazine print subscription.